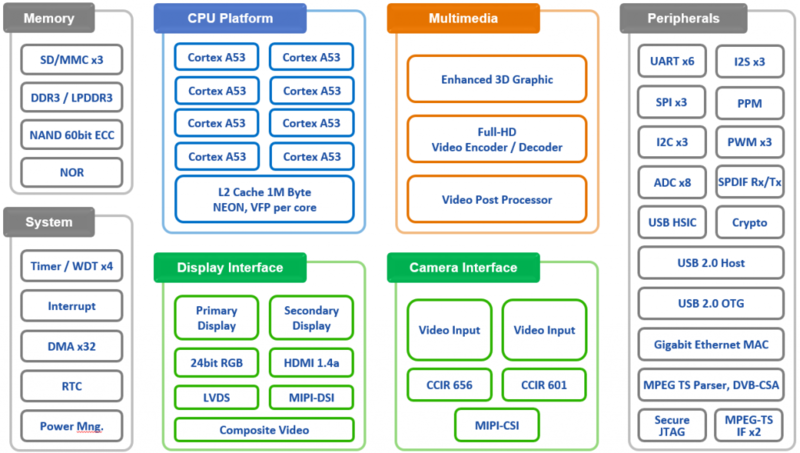 S5P6818High performance Multimedia 64bit Octa(x8) core Application Processor – Nexell Co.,LTD. S5P6818 uses the Cortex-A53 Octa-cores, which are based on the ARMv8-A architecture and deliver more performance for ARMv7 32-bit code in AArch32 execution state, and offer support for 64-bit data and larger virtual addressing space in AArch64 execution state. It provides 6.4 GB/s memory bandwidth for heavy traffic operations such as 1080p video encoding and decoding, 3D graphics display and high resolution image signal processing with Full HD display. The application processor supports dynamic virtual address mapping, which helps software engineers to fully utilize the memory resources with ease. S5P6818 provides the best 3D graphics performance with wide range of APIs, such as OpenGL ES1.1, 2.0.Superior 3D performance fully supports Full HD display. The native dual display, in particular, supports Full HD resolution of a main LCD display and 1080p 60 frame HDTV display throughout HDMI, simultaneously. Separate post processing pipeline enables S5P6818 to make a real display scenario.